I'm so excited to be able to bring you my first campaign with a company! BRITA recently contacted me to tell me all about their Better with BRITA campaign in partnership with food magazine Delicious. They are looking for people who share their passion for using delicious tasting ingredients in their meals and drinks at home. Particularly if like me you live in a hard water area, any recipes that use water (including my morning cuppa) can often leave a taste in the mouth that isn't pleasant. All BRITA products reduce the unwanted substances that we all have in our tap water such as chlorine & heavy metals, leaving just the purest tasting water behind. BRITA believes that you should not have to compromise when it comes to making recipes that use water as a key ingredient. In recognition of this, they, along with Delicious magazine, are launching the Better with BRITA competition to award three individuals the chance to showcase and sell their produce at The Big Feastival running from the 29th August - 1st September 2014. If you are making super sorbets, gorgeous gazpacho or beautiful bakes at home, using filtered water and local, quality ingredients then this competition is for you. All you need to do is upload your recipe with a photo of the finished product and your background story to the Better with BRITA competition page before the closing date of 30th June 2014. 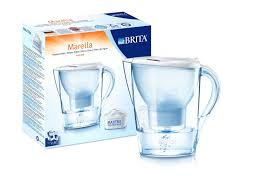 To wet your appetite and let you experience the different BRITA makes to the taste of tap water, BRITA have very kindly given me one BRITA Marella water filter jug (RRP £33) for one lucky reader to win. To enter, use the Rafflecopter below before the closing date of May 16th 2014. Sorry only open to UK entrants. This post is written in collaboration with BRITA to showcase their Better with BRITA competition, however all thoughts and opinions remain my own. i only ever drink water or Pepsi Max so either of them! Thanks for this! I won! Yey!